Prune Plum trees in the growing season or after the plums have been picked, making sure the weather is suitable. Pruning wounds heal a lot quicker on a hot, dry day. Only prune where this is strictly necessary. A poorly fruiting plum tree will not produce more fruit if it is pruned. On the contrary, pruning encourages vegetative growth and this may cause the tree to produce less fruit. Cut away dead wood and make sure the air can circulate freely around the tree. Thin out where branches are crossed or hanging too closely together. Paint wounds with sealing wax. 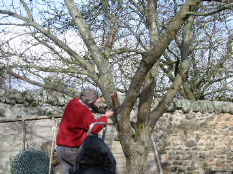 Remove fallen fruit from around trees to prevent parasites and disease.